Imagine stumbling upon a piece of rock in your backyard and finding that it’s an ancient artefact. Unbelievable as it may sound, there have been such accidental discoveries in Delhi and its immediate surroundings, say experts and historians. What may sound stranger than fiction is an incident narrated by historian Upinder Singh in the book Celebrating Delhi (2010), edited by Mala Dayal. In the chapter “Discovering The Ancient In Modern Delhi", Singh relates how a prehistoric Stone Age tool, an Acheulean hand axe, was found at a bus stop inside the forested Jawaharlal Nehru University (JNU) campus in 1983. “If I correctly recall what B.M. Pande told me many years ago, he had taken a bus...to visit his friend Prof. B. D. Chattopadhyaya... He saw the hand axe on the ground in front of him as he got off at the bus stop." “People in Delhi seldom realize where they are driving or living," says Pranay Lal, author of Indica: A Deep Natural History Of The Indian Subcontinent (2016). “Delhi is not the flat landscape we tend to think (it is). In its undulating underbelly are rocks as old as life on earth—a whopping 3.2 billion years old. If you dig only a little way into the pale yellow-brown soil, you will find rocks waiting patiently for their tales to be told. In some places, you may not even have to dig at all. All you need to do is stop your car or break stride and you will see rocks lying over the ground forming little hillocks and overhangs in motley shades of burnt red, possibly holding some hardy plants and well-camouflaged snakes or insects in their crevices". To help us visualize this landscape, Lal created an illustration of a 20km cross-section, as the crow flies, from Rashtrapati Bhavan to DLF Cyber Hub, based on geological maps from the Central Ground Water Board and Delhi Metro Rail Corporation. There are over 40 sites in south Delhi and adjoining Haryana where historians Dilip K. Chakrabarti and Nayanjot Lahiri found ancient stone tools. “These tools are from the lower Palaeolithic period to the Mesolithic period and this area is presumed to host many Stone Age tool-making factories. Most of these are tear-shaped, palm-sized rocks with manipulated edges; spotting them needs both practice and expertise, but once you get a sense of what to look for, it is not impossible to find them," says Lal. These ancient rocks are part of the oldest mountain range in the world—the Aravalli range, or “The Ridge", as it has been more commonly known in Delhi from the days of British rule. A large section of Delhi, including the JNU campus, sits on this ancient range. The Aravalli mountain range spans over 800km from Gujarat to Delhi (through Rajasthan and Haryana). From Delhi, it extends to Haridwar but is completely hidden below the earth’s surface. “It took two billion years (from a point in time between 3.2 billion years to 1.2 billion years ago) of shoving and pushing of tectonic plates and magma outpourings to create these ancient fold mountains," explains Lal. In terms of geological time, then, the Aravallis are older than the Himalayas. But the mountain range and its tropical dry deciduous forests never gained popularity as a biogeographic hot spot or an ecological heritage monument. What can be more baffling? Particularly since this ancient mountain range shaped much of the northern Indian landscape in more ways than one—by blocking the spread of desert sand to the Indo-Gangetic plains; by directing the flow of rivers; by recharging groundwater in aquifers; and by acting as the “green lungs" for a polluted city like Delhi and its surrounding areas. In fact, four of the seven historical cities that stood in the Delhi area were directly on the Aravallis—the medieval cities of Lal Kot, Qila Rai Pithora, Mehrauli and Tughlaqabad. “Unknown to many, the Aravallis remain as the last ‘commons’, a refuge for wildlife, for hundreds of species of trees, shrubs, and herbs. The vegetation of the Aravallis has evolved and adapted to its special conditions over millions of years," says Chetan Agarwal, an independent environmental analyst and senior fellow with the Centre for Ecology Development and Research (CEDAR). The British marked the Aravallis as the “gair mumkin pahar", as the hills were considered unfit for cultivation. The range is still called that in land records. But the Aravallis provided valuable metamorphic rocks—quartzite and sandstone—and were also rich in zinc, gold, silver, copper, lead, limestone and marble. The mountains have had to pay a heavy price for this in the form of mining. Once a contiguous range, what remains today of the mighty Aravallis (in Delhi) are rocky outcrops divided into five fragmented zones—the Northern Ridge, the Central Ridge, the South-Central Ridge, the Southern Ridge and the Nanakpura South-Central Ridge. In these pockets of wilderness, jackals, nilgai and black-naped hares still roam free. But growing anthropogenic pressure, including excessive mining and waste dumping, have altered the range beyond recognition. The hills of yore are alive only in the names of localities—Raisina Hill, Majnu-Ka-Tila and Paharganj. From any vantage point in central Delhi, the view of the Ridge forest is still captivating. Very few megapolises in the world can claim such a stunning landscape: a sea of green punctuated by the dome of Rashtrapati Bhavan at one end and Qutub Minar on the other. It is said that the British undertook massive afforestation of the Ridge when the capital of India was being shifted from Calcutta (now Kolkata) to New Delhi. But instead of planting species native to the Aravallis, the colonial planners planted the exotic Prosopis juliflora or vilayati kikar, a native of Central America. What we see today on the Ridge is a proliferation of this one species, which dominates other native plants such as babul, dhak, ronjh, katha and phulahi. After independence, industrialization and urbanization took a heavy toll on the Aravallis, and, by the 1970s, a large chunk of the mountain range had been destroyed. This could have been the fate of the entire Ridge in Delhi had it not been for the campaign started by a group of students in the late 1970s. In the mid-1980s, lawyer M.C. Mehta joined the campaign by bringing the environmental degradation issue to the attention of the Supreme Court. A decade later, on the direction of the apex court, the Ridge Management Board was constituted for the conservation and protection of the last of the Ridge forests. This timely intervention by civil society, media and the courts has ensured that some of the ecological sanctity of the Aravalli forests in Delhi remains. The Asola Bhatti Wildlife Sanctuary, Aravalli Biodiversity Park and Sanjay Van are examples where the creation of protected areas has given nature a chance to bounce back. Haryana hardly has any areas formally notified as forest land. Just south of Delhi’s Asola Bhatti Wildlife Sanctuary, bordering the districts of Faridabad and Gurugram, is the village of Mangar and its commons—Mangar Bani (a small forest in local parlance). According to state land records, this also falls under the gair mumkin pahar. Several experts have opined that the Mangar forest, protected by villagers as a sacred grove in the memory of a holy man, Gudariya Baba, is the last remnant of the original forests of the Aravallis. Pradip Krishen, author-photographer, reminisces: “Mangar Bani was a small valley that was startlingly beautiful even in the harsh winter months when trees are stripped of green foliage. All the trees on the steep slopes were of the same species, the dhau, and they would all turn shades of purple in ragged asynchrony. 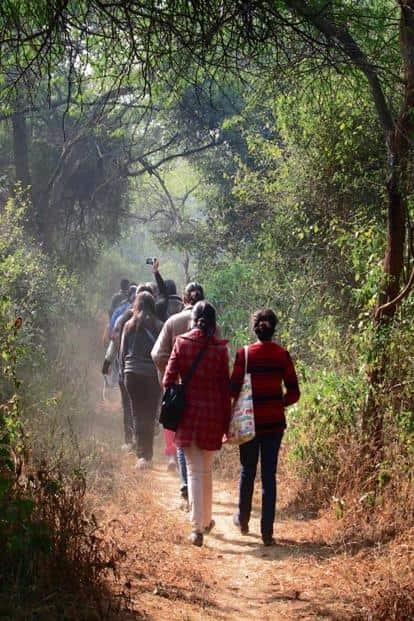 I had seen versions of this kind of forest in places like Ranthambhore and Bundelkhand, but Mangar Bani was special not just because it was so close to Delhi but also because it had not been protected by governmental notification or uniformed guards." In 2016, surveys by wildlife experts revealed the presence of leopards, the striped hyena, golden jackal, grey mongoose and small Indian civet. Mangar has also been a revelation for birders. Species which were considered rare or vagrant for this region, like the white-bellied drongo, the Indian pitta and the black-headed cuckooshrike, were found to be residents of the forest. But as modern, swanky offices, skyscrapers and elevated roads took over the surrounding landscape, the aspirations of the villagers grew too. Much of the gair mumkin pahar, which was protected by folklore, changed hands. Today, barring a few acres left with the village panchayat, the entire village commons has been sold to builders and individuals. Environmentalists worry about government inaction in protecting these ecological hot spots. There are many such forest patches in the Aravallis which need protection—and time is running out.